Palm Sunday marks the beginning of Holy Week in the church, the time when Christians specifically remember how Our Lord entered Jerusalem, fulfilling the prophecy of the coming of the Messiah (Zech 9:9), established the New Covenant in His blood and rose again from the dead. Join us this week as we worship Our Lord. We will shout Hossanna with the crowd, celebrate the New Passover that Jesus established with his followers, pray with him in the Garden of Gethsemane, walk with him to the hill of Calvary and finally, find the tomb empty on Easter Day. 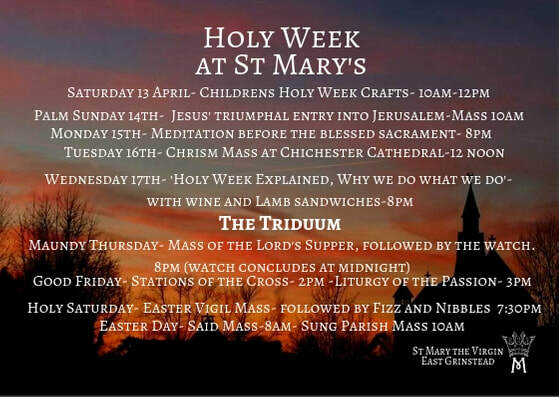 Below is the Holy Week service list, it would wonderful to see you there.